9/22/2012Share this story on Facebook! 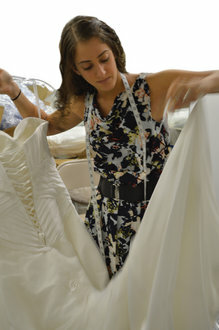 Learn more about the integrated marketing communications program that helped Julie launch her own line of wedding dresses. Julie Levitt ’11 rocked the College’s blue and gold colors as an undergrad, but these days she’s seeing a lot more white. Last year, Levitt, a former integrated marketing communications major, launched Magnolia by Marionat, a line of wedding gowns that complement Marionat’s widely successful collection of bridal accessories. As fashion director for the company, Levitt designs the dresses and travels the world—from China to Chicago and New York—to promote them.